Part DI, part preamp, and part A/B switcher all rolled into one pedal with a big emphasis on quality, versatility, and reliability, Ruppert Musical Instruments’ flagship Basswitch and Acouswitch share an 8.5″ x 6.25″ x 1.5″ heavy-steel chassis, Lehle actuator-style footswitches, Lehle True Sound Technology buffer circuits, balanced XLR outputs with Lehle transformers, chassis-mounted .25″ jacks, series effects loops, parallel effects loops with mix control, foot-switchable boost circuits, and tuner outs with a mute foot switch. Both pedals have an ingenious ridge into which all of the control knobs are semi-recessed, protecting them not only from physical damage but also helping prevent settings from being disturbed when the pedals are in transport. 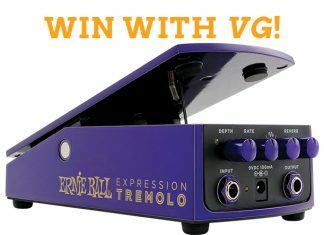 Both pedals function as direct-input (DI) devices, allowing the user to run an instrument’s signal over long cables without picking up radio frequencies or any other unwanted noise, serve as preamps to boost levels and manipulate tone, as effects loops to insert one or more effects into the signal chain with a footswitch, as solo boosters, and as A/B boxes to switch between two instruments with a footswitch. On the Acouswitch, the A/B switching circuit can also be set to mix both signals from inputs A and B for instruments with multiple pickups or outputs, like an acoustic guitar with a piezo and a magnetic pickup. The A/B footswitch also has a dual-colored LED (blue for input A and white for channel) to easily keep track of which input is active. The A/B footswitch also doubles as an EQ bypass switch when only a single input is used, useful for different EQ setups with an acoustic or bass. For power, both pedals accept anything from 9 to 20 volts DC, making them very pedalboard-friendly. And, regardless of the voltage fed into either, its internal power circuit rectifies it and maintains it at 18 volts, ensuring ample headroom for increases in dynamic range, which is ideal for instruments with active pickups and onboard active electronics. The balanced XLR outputs are armed with ground-lift switches to eliminate ground loops between the stage and the front-of-house mixer, and Pre/Post EQ switches that allow the player to tweak the preamp’s EQ and any effects inserted into the loop to their heart’s content without affecting the FOH mix. There’s also a Pad switch for sensitive mixer preamps. We tested the Acouswitch with a Breedlove DSRe acoustic guitar with an LR Baggs pickup connected to a JBL EON 15 powered PA speaker, then through a dedicated acoustic-guitar amp. Its three-band EQ circuit offered a wide frequency sweep on the semi-parametric Midrange control and deep amplitude – 18 dB, plus or minus, on all three bands – giving the player tons of control to manipulate sound. The voicing of the tone circuits was very smooth, with a nice musical quality. Even when digging in deep or boosting heavily, it always sounded natural, without the obvious out-of-phase characteristics of cheaper EQ circuits. The Acouswitch also has a Body Contour control with an extra-deep/narrow bass notch filter (-24dB) in Cut mode, or a second Midrange Low control in Boost mode. The Contour control sweeps from 45Hz to 500Hz, allowing the player to precisely control and eliminate low-end feedback without killing all the thumpy bass and percussive body talk from their sound. The Basswitch was tested through an active bass with dual humbuckers connected to a JBL EON 15, as well as an all-tube single 15″ combo. Its EQ section has a four-band tone circuit with two semi-parametric midrange controls, along with controls for fixed Bass and Treble. 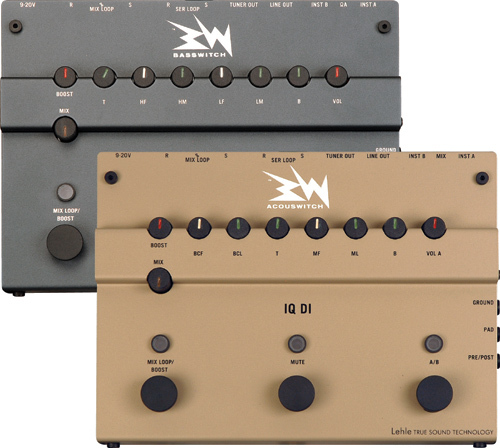 The natural musical sound of the Acouswitch’s EQ section was mirrored in the Basswitch – clean, natural, low-noise, versatile, and with tons of headroom. Input A on the Basswitch can be switched and also offers an impedance switch, allowing the user to move it from 1 mega ohm to 10 mega ohms to accommodate the piezo pickup of an upright bass, adding to its versatility. The RMI Acouswitch and Basswitch are not typical stompbox preamps. They offer not only studio-quality sound with high-end EQ circuits normally found only in pricey rackmount preamps, but a host of user-friendly switching options combined with robust road-ready construction.